The Mai-Kai is world famous for its extensive menu of nearly 50 tropical drinks that date back a half-century or more. Everyone knows about the Barrel O’ Rum, Black Magic, and iconic Mystery Drink. But lesser known are the dozen or so classics that for one reason or another disappeared from the menu over the past half century, destined to never be served again in the legendary Fort Lauderdale restaurant. Or so we thought. One notable drink, the Demerara Cocktail, made a welcome comeback during a special event in August 2012 organized by South Florida tikiphiles. It has since made several more appearances at special events, leading a parade of other “lost cocktails” that have returned from the dead over the past four years. As of October 2016, we’ve had the pleasure of sampling nine cocktails from the original 1956-57 menu, plus three off-the-menu classics. The Demerara Cocktail was likely removed in the late ’80s or early ’90s when the crucial Lemon Hart Demerara rum became scarce and was dropped from the bar’s inventory. Over the past decade, however, interest in vintage Tiki cocktails – and the flavorful Demerara rum from Guyana – has experienced a revival that continues to grow. By mid-2012, The Mai-Kai had become the Mecca for Tiki cocktail enthusiasts, and Lemon Hart made a grand return to the cocktail menu (covered here in great detail). The next logical step was the resurrection of this forgotten gem. 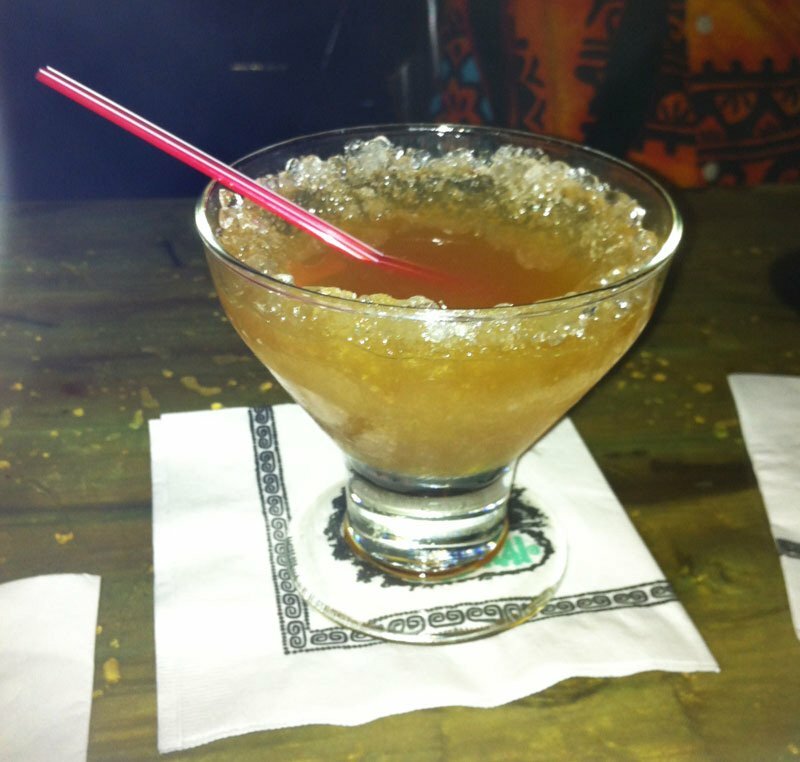 The Demerara Cocktail had actually been revived in 2007 by Jeff “Beachbum” Berry in his definitive chapter on The Mai-Kai in Sippin’ Safari. 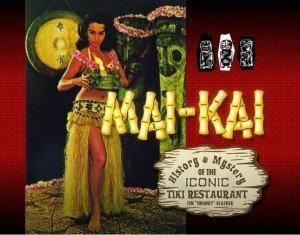 This essential book includes not only tons of vintage recipes and photos, but a fascinating look at The Mai-Kai’s origins and insights into its cocktail genealogy. Berry tells the story of mixologist Mariano Licudine’s rise through the ranks at Tiki pioneer Don the Beachcomber’s restaurants in the 1940s and ’50s, his move to Fort Lauderdale and the heady early days of The Mai-Kai. Look for a special expanded 10th anniversary edition of the book to be released soon. Okole Maluna Society menu from The Mai-Kai. In Sippin’ Safari, Berry revealed three authentic early Mai-Kai recipes from Licudine: Last Rites, Big Bamboo, and the one below for the Demerara Cocktail. 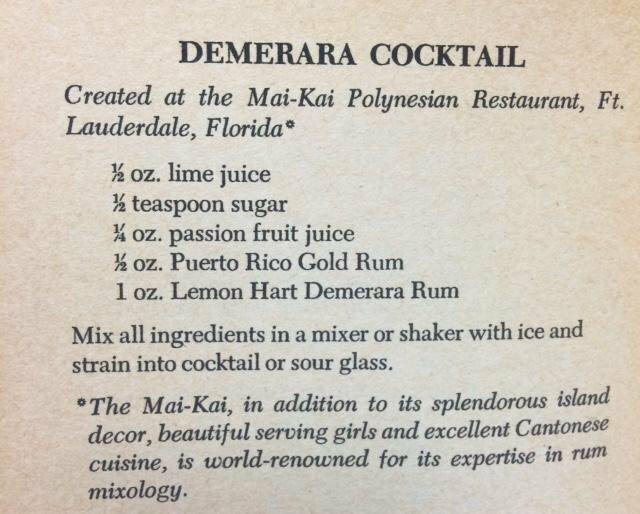 Another curiosity that reveals what a mid-century visit to The Mai-Kai must have been like is the Okole Maluna Society, which inspired this cocktail guide. Beachbum Berry wrote that to become a member, you had to consume all 48 drinks on the menu, at which time you received a personalized bamboo cup and a special drink (the Big Bamboo). Okole maluna is a common toast in Hawaii, meaning bottoms up. 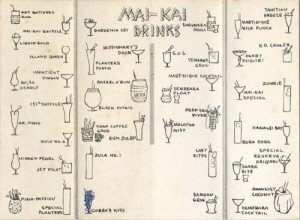 The image above, uncovered by Tim “Swanky” Glazner and posted on his SwankPad blog, shows the inside of the Okole Maluna Society menu, most likely from the late 1950s. It includes the Demerara Cocktail, and you’ll notice that several drinks are marked off as its owner attempted to sample the entire menu. Here’s hoping he or she completed their journey. To learn more about the Okole Maluna Society and The Mai-Kai’s early years, pick up a copy of Glazner’s new book (released in September 2016 by Schiffer), Mai-Kai: History and Mystery of the Iconic Tiki Restaurant. Via exclusive stories and more than 400 images, the book instantly transports you back in time to an era of classics like the Demerara Cocktail. Flavor profile: Lime juice, Demerara rum, passion fruit. Review: A showcase for the Demerara rum, simultaneously sweet and strong with similarities to the Mara-Amu. Rating: 3 1/2 out of 5 stars (see how it ranks). If it were still on the menu today, I would rank it around No. 20. This is a significant jump after we sampled the real deal. 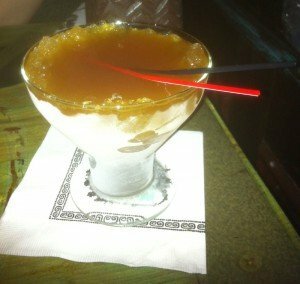 Ancestry: Based on a Don the Beachcomber drink of the same name, the Demerara Cocktail was on the original Mai-Kai cocktail menu, but it was retired in the 1980s or early ’90s when Demerara rum went on a hiatus from The Mai-Kai. The more potent Demerara Float, which is a very similar drink with the addition of a floater of 151 Demerara rum, was retired around the same time. Bilge: Since its unveiling in Sippin’ Safari, the Demerara Cocktail has been explored by quite a few bloggers, including Doug on The Pegu Blog, Tiare on A Mountain Of Crushed Ice, and Rowen on Fogged In Lounge. Agree or disagree? Share your reviews and comments below! Shake well over ice. Strain into a cocktail or a specialty glass. This small cocktail packs a powerful punch thanks to the 3 ounces of rum. It’s in the style of a traditional Daiquiri, with lots of extra flavor from the passion fruit juice (or nectar if you prefer) and Demerara rum. In Sippin’ Safari, Berry attributes the recipe directly to Mariano Licudine, circa 1956. It’s likely that our favorite Tiki cocktail sleuth culled this recipe from Mr. Lemon Hart’s Tropccal Treats, a rare recipe book released in 1973. 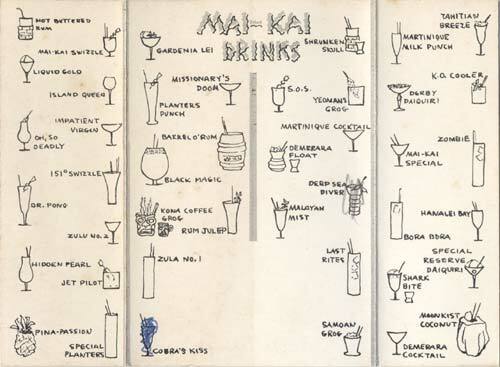 The book’s “drink editor” was a former manager at The Mai-Kai, Leonce Picot, who was credited by Glazner in Mai-Kai: History and Mystery of the Iconic Tiki Restaurant as being one of the creators of the famous Mystery Drink. See more on Picot and the Lemon Hart book in our Demerara Float recipe review. The title of the book appears in the Sippin’ Safari bibliography, and a recent Tiki Central post revealed the exact same Demerara Cocktail recipe, scanned from the book (see it here). The only difference is that Berry’s recipe simply doubles the amounts called for in the Lemon Hart recipe. Which we wholeheartedly endorse. It’s possible that a very small version was once offered, but we prefer this larger version for at-home imbibing. As for the current version, as you’ll see below, it basically splits the difference with 2 ounces of rum, then adds sweetness via passion fruit syrup. As of mid-2016, 80-proof Lemon Hart was still hard to find in the United States, but there are many other options. The most obvious choice is the fine El Dorado rums, such as the cask aged 5- and 8-year-old rums or the luxury cask aged 12- and 15-year-old rums. In early 2015, Hamilton rums from Guyana came to market, providing the best replacement yet for Lemon Hart, both regular and overproof. As of this update, Hamilton 86 from Guyana is The Mai-Kai’s go-to standard-proof Demerara rum. As for the gold rum, we like the sweetness of the aged Ron del Barrilito expressions from Puerto Rico since this drink is on the sour and dry side. Something a bit older, such as 7-year-old Flor de Cana (a Cuban-style rum from Nicaragua), is also great if you’re looking for a drink that’s less sweet and a little bolder. There are many other gold Spanish-style rums that would work well, including Cuba’s Havana Club (where available), Cruzan Single Barrel Estate (Virgin Islands), plus Puerto Rico’s Bacardi 8, Bacardi Select, and Don Q Anejo. Pulse blend in a blender or spindle mixer with 1/2 cup of crushed ice for 6-8 seconds. Strain into a chilled cocktail or a specialty glass with ice shell. While all the old menu artwork (such as the image above) shows the Demerara Cocktail served in a long-stemmed glass, the preferred vessel during its recent revival is a squat cocktail coupe featuring a distinctive ice shell. Ice features are a specialty of The Mai-Kai, and you’ll often find this glass and ice treatment given to the Shark Bite, a longtime favorite that has remained on the menu since day one. It’s also used for the Demerara Cocktail’s stronger brethren, the Demerara Float. Somehow, drinks at The Mai-Kai always taste better than the at-home version. I’m sure a big part of it is the atmosphere, but there’s something else at work here. We believe the revived version was tweaked a bit from its original recipe that Beachbum Berry published. Most likely, it was changed in the 1970s or ’80s as customers began to prefer sweeter, more savory drinks. The tribute above is an attempt to duplicate this updated version, which most likely dates back to Mariano Lucudine’s final recipes when he retired in 1979. By 2016, Licudine and The Mai-Kai have become touchstones for a new generation of Tiki-inspired bars opening around the world. Undertow opened in Phoenix, Ariz., with a menu that includes many inventive original craft cocktails. But the bar also pays tribute to the godfathers of the genre, from Trader Vic to Don the Beachcomber to Steve Crane. It’s heartening to see Lucudine’s version of the Demerara Cocktail right alongside Vic’s Mai Tai and Donn’s Zombie. 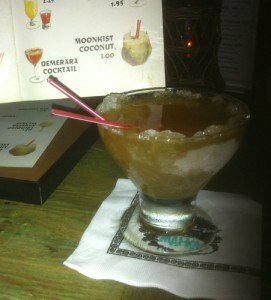 * As mentioned above, the return in 2012 of Lemon Hart to The Mai-Kai made this cocktail possible. The 80-proof version of this rare rum has disappeared from U.S. shelves again, but that doesn’t mean the end of the Demerara Cocktail. Simply use any of the El Dorado rums mentioned in the official recipe above. Or better yet, pick up a bottle (or bottles) of the new Hamilton rums from Guyana, part of noted rum importer Ed Hamilton’s Ministry of Rum Collection. Instead of the Spanish-style gold rum used in the original recipe, I went with Appleton Special from Jamaica in this tribute. I seemed to detect its distinctive taste that you’ll find in many other current drinks., and I like the way it plays off the Demerara rum. * There’s a complex consistency present in the updated version that I’m not tasting in the original from Sippin’ Safari. 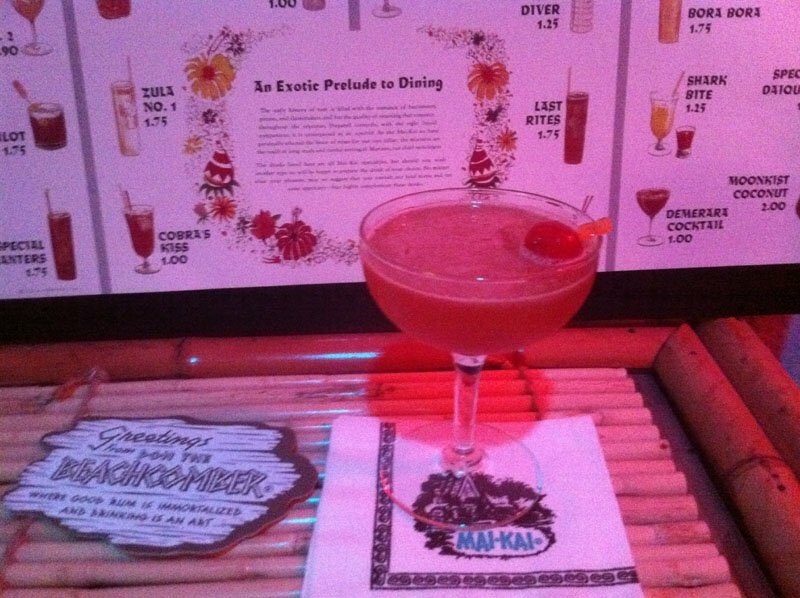 My guess is that passion fruit juice was replaced by The Mai-Kai’s rich, house-made syrup, giving the drink a bold flavor and sweetness. The closest we’ve been able to find is Aunty Lilikoi’s from Hawaii. Lower-cost options include the Monin and Finest Call brands. Or you could try making your own following the recipe in Sippin’ Safari, which we always enjoy. If you prefer a clean and dry drink, you may want to stick with the early version. But if you’ve had the pleasure of tasting the contemporary Demerara Cocktail, you’ll probably agree that it’s a perfect fit for the current menu. If we’re lucky, it will continue to come out of retirement for more reunion tours. This entry was posted in Cocktail reviews, Cocktails, Cocktails, Culture, History, History, Mai-Kai, Recipes, Rum and tagged Beachbum Berry, Demerara Cocktail, Demerara rum, Don The Beachcomber, Hamilton 86, Hamilton rum, Hukilau, Lemon Hart, Mai-Kai, Mariano Licudine, Okole Maluna Society, recipe, rum, Sippin' Safari. Bookmark the permalink. Playing catch-up and reading a couple of posts that I missed when they first went up, including this one on a Sippin’ Safari recipe that I haven’t revisited in quite a while until I just shook one up this evening. Which Ron del Barrilito are you suggesting for this drink, 2 Star or 3 star? I try to keep the 2 star on hand mostly to have with coconut water as a simple, perfect summer sipper. I also will usually have either the Barrilito 3 star or Bacardi 8 around as my premium PR mixing rums (Bacardi 8 is actually the only Bacardi product I would include in my “essential rums” list). Alas, tonight I am lacking any of the above, so I substituted Chairman’s Reserve in place of the PR rum. Lemon Hart was used as the Demerara. All in all, this is a very nice high-octane daiquiri that tastes good enough that I just might have another. . . Sunny, you have good taste. We try to work the Ron del Barrilito 3 star into cocktails whenever possible. And Bacardi 8 is a great choice as well. FYI, we’ll have more reviews of “retired” Mai-Kai cocktails coming up soon. Enjoyed your tribute very much. I made a rich simple syrup and combined it 1:1 with some passion fruit pulp for the syrup. It was just great. I’m still trying to find the best rums for the Sippin Safari Recipe. they are much harder to find here in Alabama/Georgia. Thanks for the wonderful blog and cocktail lists! Mahalo! We definitely have more classic recipes to come. Stay tuned.